In my day, an eco-friendly trick or treat bag was a pillowcase from the linen closet. Lucky for this generation, an adorable, stylish, green spin on the candy catcher is up for grabs in the handmade, 100% cotton canvas Jack on Black Halloween Bucket! 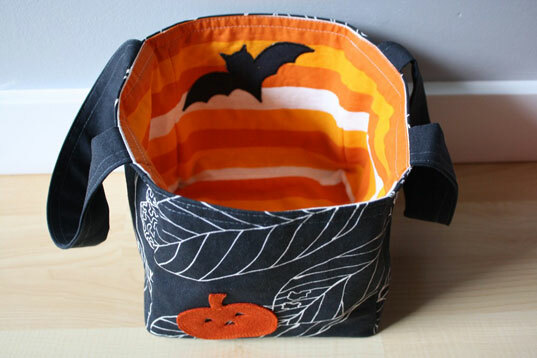 This black and white fabric bucket features an orange felt jack-o-lantern on the front, and a black felt bat lurks on the inside. A bright orange candy-corn striped lining completes the festive look of the bucket, which may be reused year after year for candy collecting! The Jack on Black Halloween bucket may be personalized with a single initial from your child’s name, which should help cut back on the sibling squabbles when it’s time to divvy up the bounty! Designed and handcrafted by Smidgebox on Etsy, the Halloween bucket may also be tailor made to coordinate with your child’s Halloween costume! Simply convo the Etsy shop with ideas and color preferences. 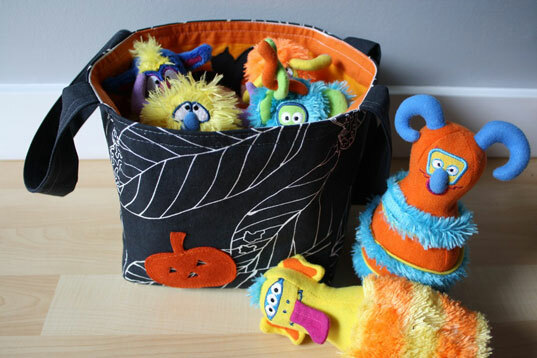 And fear not – the Halloween bucket needn’t be stowed away the other 364 days of the year — use it to wrangle toys and dress-up accessories to keep kids’ rooms from looking a fright!